Don’t feel confident cooking fish, or think it’s worth cooking for one? This easy one-pan meal – complete with vegetables – for one or more people is an easy and delicious place to start. Quantities are per person and can multiply up to four or five people, depending on the size of your baking dish and oven width. Fire up the oven to 220c (fan) and find a baking dish (ceramic or metal) to fit the potatoes in a single layer. If you don’t like washing up, line it with foil or parchment. Tip the oil into a plastic bag or bowl and toss the spuds and garlic with a sprinkle of salt. Arrange in a single layer in the dish and bake for 20 minutes. Don’t chuck out the oil or bag just yet – add the asparagus to gently coat. Remove from oven and give the spuds a good shake to loosen. Add the asparagus in a layer on top. Cook for a further 15 minutes. Take out of the oven and give the pan another shake. 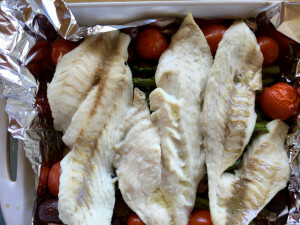 Season the fish and lie on top of the asparagus, sprinkle the tomatoes around the fish and throw in some olives if desired. Sprinkle the fish with a little oil so it doesn’t dry out. Bake 10 to 15 minutes until the fish is cooked. A thin-ish piece of snapper might take a little less than 10, while a thick salmon fillet may take a full 15 minutes or more. The fish is cooked when it flakes when you gently poke a knife halfway into it. Assemble the vegetables and fish on a plate. Serve as is, or with a wedge of lemon. If you’re feeling adventurous, a spoonful of salsa verde on the fish would give it a gentle kick. Bonus: if you’ve used a bag to oil the vegetables and lined the dish with foil or parchment – there is little or no cleaning up required! This recipe is gluten-free, dairy-free and paleo-friendly. It first appeared in January 2016 newsletter. If you’d like a healthy recipe in your inbox and thoughtful health tips and links please sign up for the free newsletter. Want more simple seafood recipes? Or perhaps some vegan options instead. There are over 100 original healthy recipes in the resources section of this website.